Our company specializes in making your next yacht charter destination a forever memory. We offer Half and Full Day, Private, Excursions, 24 hour, and private multi-day sailing charters catered to your desires to various destinations. Want to be pampered? Inquire with in about our professional chef service and provisioning. There is so much to see and do on a sailing charter. Our most popular charter is to the Dry Tortugas, however there is so many places to go in Key West; the possibilities are endless. The barrier reefs of Key West have been compared to the quality of that of the Australian Great Barrier Reefs. You will find crystal clear water and sandy white beaches to kick back and relax and enjoy the beauty. Find your next anchorage destination with us. This day typically lasts about four hours from the time you leave the marina to the time you get back and may include fueling time. 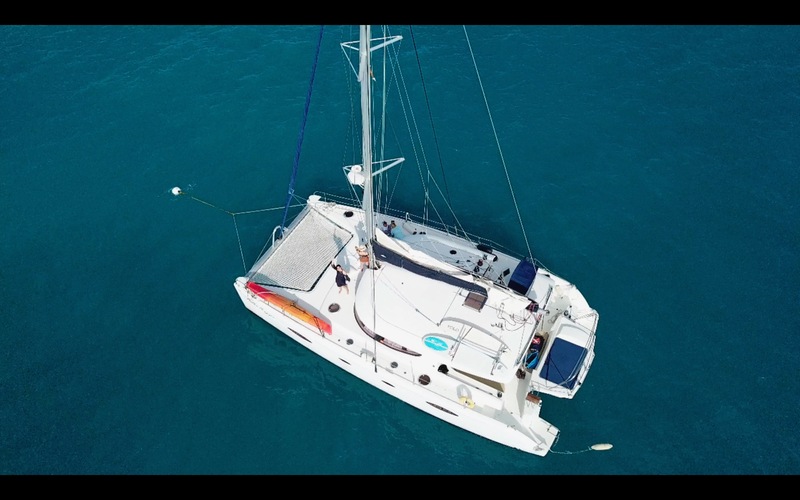 The most popular activity on this charter is to sail to the coral reef system (45 mins one way), grab a mooring ball and snorkel. Many people enjoy the size of our yachts and like being able to take everything along with them including the “kitchen sink.” Fishing is also a popular activity on this charter whether trolling while sailing or fishing the reef at anchor. Other activities such as spearfishing, diving, and catching lobster can be taken in during this trip. It is common to have dolphin encounters as well as sea turtle sightings. Most charter customers take in a sunset sail back to the marina to close out there day. 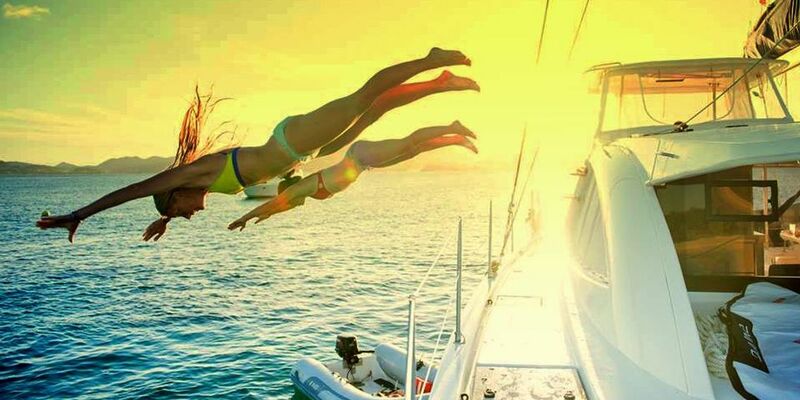 Most charter customers find that it is nearly impossible to take in all these activities in a half day yacht charter. Experience everything that you can in a half day with double the time to take in more activities. Usually these excursions last about eight hours. 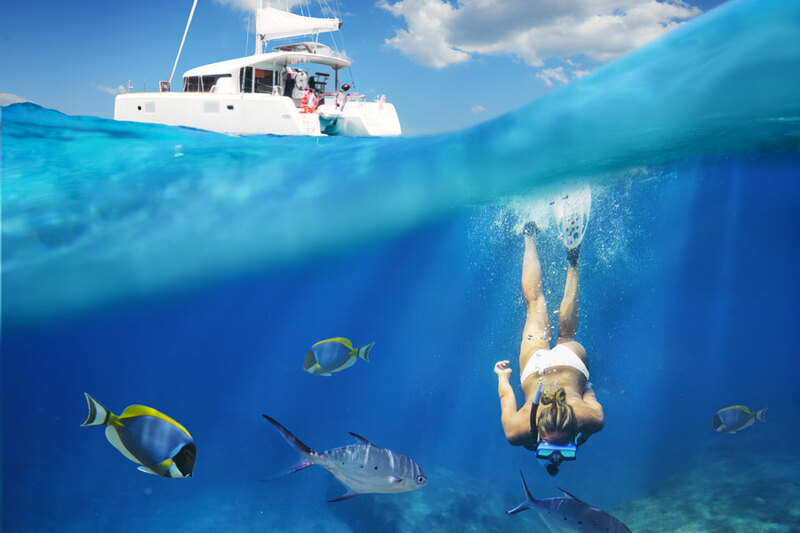 In addition to the popular activities such as: snorkeling, fishing, diving, catching lobster, spearfishing, sunset sail, and dolphin encounters; Island Hopping and a guided tour of Key West, ocean side, are popular activities. Sail to the popular Woman Key and get out and enjoy the beach and island. From there visit other uninhabited islands taking in the scenery and wildlife. For those who prefer to stay on board, request a captain with historical knowledge of Key West, and be transformed as your captain guides you around Key West. Take in everything of a full day excursion but stay out on the ocean even longer. Take a sunset sail to the famous Boca Grande Island with breathtaking views. This uninhabited island is surrounded by crystal clear bright blue water and beautiful wildlife. Dolphins also enjoy this anchorage as well as you and your boat. Take the dinghy to the island from the boat. The dinghy makes a great vessel for exploring the island and encountering dolphins. Hang out on the yacht’s spacious deck watching the stars light up the sky light and sea life light up the ocean beneath you. There are many other private island options for this charter as well. You can hire a chef or captain to prepare a menu, provision, cook, serve, and clean up after you as well. The 24 hour Island Adventure is pure tranquility and peace. A round trip private yacht charter from Key West to The Dry Tortugas National Park and Ft Jefferson is an unforgettable vacation experience. 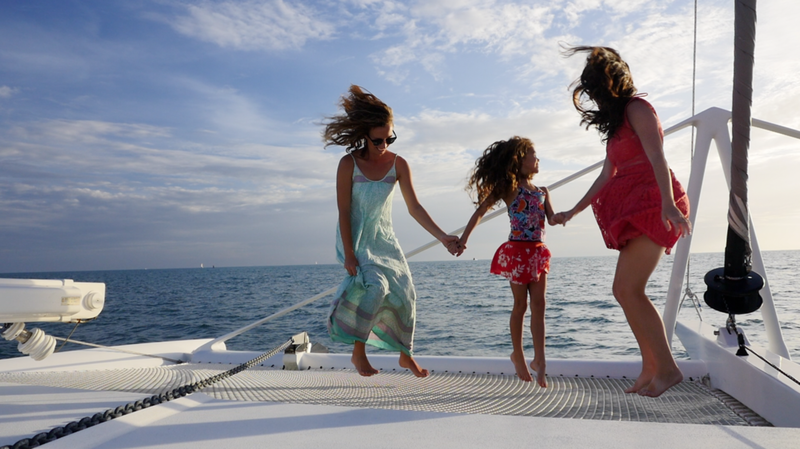 Blue Ocean Yacht Charters in Key West will set you off in a sail boat or power boat tailored to your expectations. Experience the beautiful landscape of numerous Keys (islands), breathtaking sunsets on the crystal clear, bright, blue, ocean. Watch dolphins as they jump and play with you while under way. Stop and moor along the way on some of the most beautiful coral reefs. Snorkel, fish, or relax on top of this endless aquarium. Discover shipwrecks hundreds of years old as you sail along and if you’re lucky you will come across a sunken treasure. Anchor next to some of the most beautiful private, uninhabited islands in the world with complete privacy. Relax, unwind, decompress with no sounds other than the wildlife around you. Hang out on the yacht’s spacious deck watching the stars light up the sky light and sea life light up the ocean beneath you. 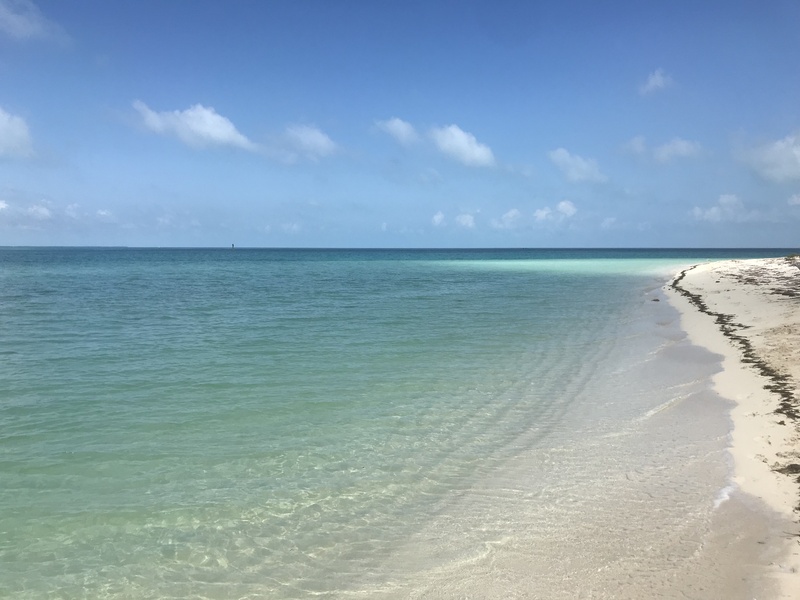 Nothing is more rewarding than to disconnect and share time with family and friends on a Key West yacht charter to The Dry Tortugas. 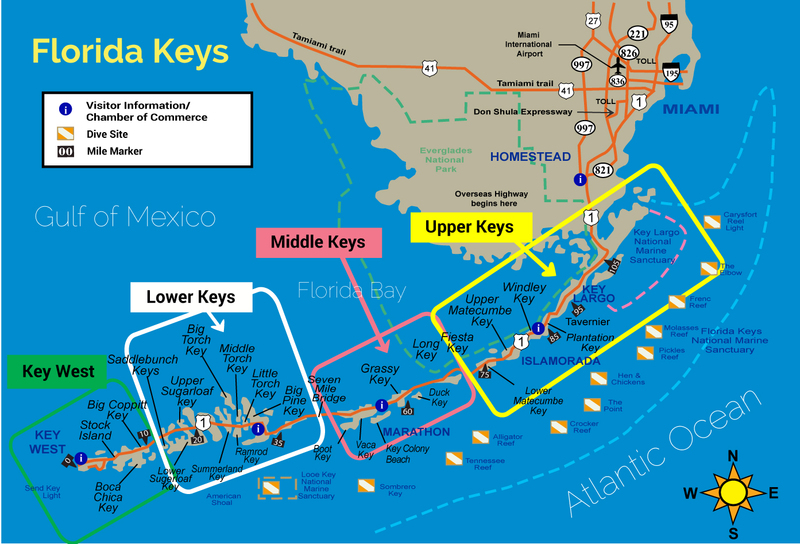 The Dry Tortugas and Ft Jefferson is located 70 miles west of Key West. This charter takes about ten hours, one way by sail. This is a minimum of five nights round trip with six nights or more recommended. There are no stores or marinas along the way, so take your time provisioning appropriately. We recommend that your first night is spent on the yacht at the marina in order for you to have time to unpack and provision before embarking. All of our yacht charters check in after 3 PM and check out prior to 11 AM. Your first possible overnight anchorage on this route is about a 3 hour sail. In the winter months we are not able to get to the first anchorage before dark so it’s best to plan on embarking first thing the following morning. The Marquises lies about 30 miles west of Key West and makes a great place to spend your second night on your way to The Dry Tortugas. The Marquises, also known as “Quick Sands,” a beautiful uninhabited island chain centrally located half way between Key West and The Dry Tortugas. You will have plenty of white sandy beaches to walk, explore, and swim here. The fishing is second to none at the Marquises. You can fish while sailing or at anchor. Nothing is better than having your fresh catch on the grill or fry pan for dinner. Dolphins also enjoy this anchorage as well as you and your boat. Take the dinghy to the island from the boat. The dinghy makes a great vessel for exploring the island chain and encountering dolphins. Most of all, the Marquises is pure tranquility, rarely do you see another boat on this anchorage. Wake up and draw your anchor and embark for the Dry Tortugas. Enjoy the clear and bright blue waters that the Gulf of Mexico provides. Arrive at Garden Key in The Dry Tortugas National Park where you will take your third nights anchorage. Take the tender to and from the dinghy beach to check in with a park ranger, get latest updates and weather reports. You will not find any cell tours here, so enjoy a vacation away from your phone and distractions. On this day you will get familiar with Fort Jefferson and the Dry Tortugas National Park rules and regulations. Stop in and see the museum and gift store. End your night on top of the beautiful wall that surrounds Ft Jefferson taking in a magical sunset over Loggerhead Key and Lighthouse. Awake, with nothing but wildlife under and around you. Bright blue, crystal clear water under you with visibility of tropical fish swimming around you in Garden Key. On this day, take in the National Parks free guided tour of Ft Jefferson. Learn about this historic landmark and the influences it has had in the past. Learn about the millions of bricks needed to build this military base. Learn about a famous doctor that was imprisoned for plotting President Lincoln’s assignation and then later discovering a cure for Malaria while there and later pardoned by the President for his efforts. There is so much more knowledge you will gain on this tour. This is an unforgettable tour and highly recommended. If time allows in your scheduled, set sail for Loggerhead Key. This famous Key holds the only lighthouse in the Dry Tortugas National Park. Furthermore it is a magical island that you can swim from its beaches and even snorkel the famous Windjammer Wreck. The Windjammer is over 150 years old and is the only ship wreck that protrudes out of the water. This is a magical snorkel as the wreck hosts amazing corals and tropical fish. Swim and dive through the remains of this historic wonder. Enjoy an evening at the Fort as you have it all to yourself, walk to moat or relax on the yacht with breath taking views. Most of all enjoy the stars as there are too many to count as they light up the sky. If time allows, there are many other beautiful keys and islands in the Dry Tortugas. Many world class diving and snorkeling sites as well. If time doesn’t allow you will head back to Key West stopping one more time for your last anchorage at the Marquises, fishing, sailing, relaxing along the way. Arrive early enough before the fuel dock closes and say good bye to your captain and/or crew. Day seven, you will check out prior to eleven o’clock. If you’re fortunate to spend another night at the Dry Tortugas, you will check out on the eighth day. There is so much to see and do on this yacht charter. 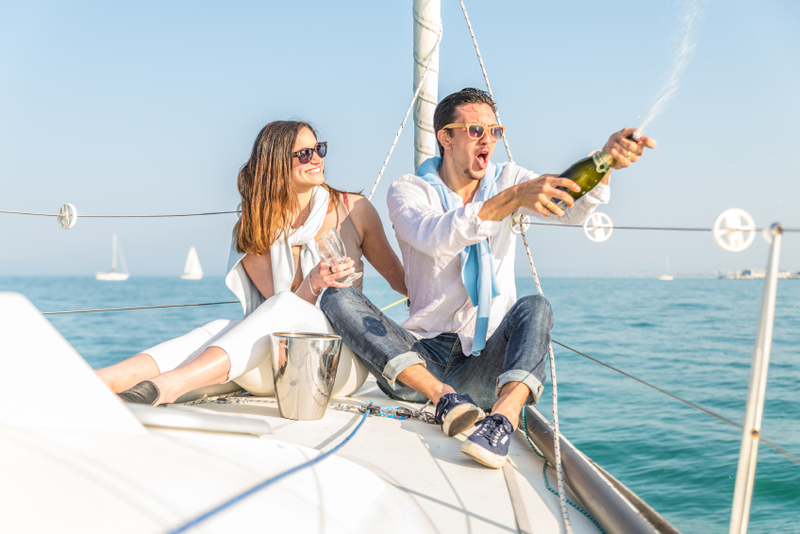 Hire a captain or chef to provision, prepare a menu, cook for you, serve you, and most helpful, to clean up after you so you can sit back, relax, and pamper yourselves to an unforgettable yacht charter. You now have our special offer. Please call or text 305-923-4152 to book your next charter.